Intel has begun commercial shipments of the industry's first field programmable gate array (FPGA) with integrated High Bandwidth Memory DRAM (HBM2). Several variants are now available including the Intel Stratix 10 GX FPGAs (with 28G transceivers) and the Intel Stratix 10 SX FPGAs (with embedded quad-core ARM processor). The Intel Stratix 10 MX FPGAs offer up to 10 times the memory bandwidth when compared with standalone DDR memory solutions, according to the company, making them suitable as multi-function accelerators for high-performance computing (HPC), data centers, network functions virtualization (NFV), and broadcast applications. The new devices provide a maximum memory bandwidth of 512 gigabytes per second with the integrated HBM2. The Intel Stratix 10 MX FPGAs are manufactured using the company's 14 nm FinFET process and state-of-the-art packaging technology, including Embedded Multi-Die Interconnect Bridge (EMIB) technology to integrate HBM2 with the monolithic FPGA fabric. "To efficiently accelerate these workloads, memory bandwidth needs to keep pace with the explosion in data" said Reynette Au, vice president of marketing, Intel Programmable Solutions Group. "We designed the Intel Stratix 10 MX family to provide a new class of FPGA-based multi-function data accelerators for HPC and HPDA markets." 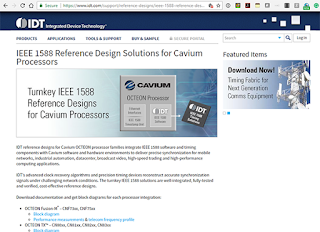 Integrated Device Technology will offer integrated IEEE 1588 software and timing components for a variety of Cavium System on Chip (SoC) solutions. IDT said the range of applications requiring precision synchronization over packet-switched networks using the IEEE 1588 protocol has expanded from mobile networks and industrial automation applications to increasing include data centers, broadcast video, high-speed trading and high-performance computing. "IDT's advanced clock recovery algorithms and precision timing devices reconstruct accurate synchronization signals under challenging network conditions for the most demanding applications," said Kris Rausch, vice president of IDT's Timing Division. 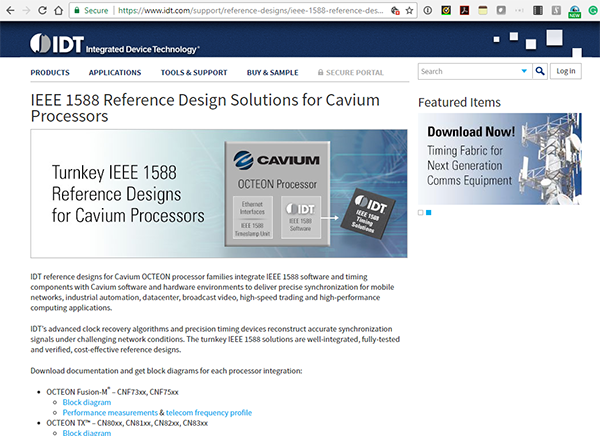 "Cavium's network infrastructure solutions have a particular need for precision timing, whether base stations, remote radio heads or even Cloud-RAN," said Raj Singh, general manager of Cavium's Wireless Broadband Group. "As we begin the transition from 4G to 5G it will become even more critical. Giving our customers access to reference designs incorporating validated IDT timing technology is an important element in helping them quickly deliver end products to the market." Avaya Holdings Corp. emerged from Chapter 11 bankruptcy proceedings. The company is seeking to reestablish a listing on the NYSE with approximately 110 million shares outstanding. Avaya said it remains focused on "mission-critical, real-time communication applications of the world’s most important operations." Its portfolio includes software and services for contact center and unified communications— offered on premises, in the cloud, or a hybrid. Avaya entered chapter 11 proceedings on 19-January-2017. In June, Extreme Networks announced a deal to acquire Avaya's networking business for approximately $100 million. 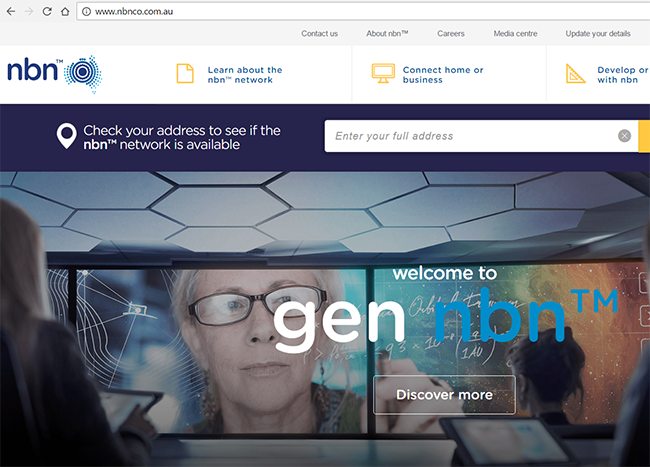 Australia's NBN Co has extended a managed services contract with Ericsson through to 2020. Ericsson will continue to be responsible for nbn fixed wireless network operations, ground systems operations for Sky Muster – the operator's satellite service – as well as customer connections and assurance for both technologies. 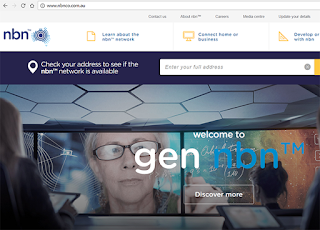 NBN Co's fixed wireless and Sky Muster services cover more than 980,000 homes in regional and remote Australia with more than 290,000 homes connected to broadband services via NBN Co's retail service providers. "As we extend our strategic partnership with NBNCo, we look forward to continuing the delivery of fixed wireless and satellite services to regional and rural Australia. The availability of ubiquitous broadband to homes and businesses across Australia will help to bridge the digital divide and support economic and community growth," stated Emilio Romeo, Managing Director of Ericsson Australia and New Zealand. Ericsson has been NBN Co's managed services provider since 2011, when it was appointed to build and operate a fixed-wireless broadband network based on TD-LTE technology. In 2014, the partnership was expanded to include operation of the ground component of NBN Co's long-term satellite solution and end user connections and assurance services. Digicel has signed a framework agreement with Cisco for accelerating the digital agenda and existing digitization policies for 26 countries in the Caribbean and Central America. The companies agreed to collaborate to develop a digitization vision for each country for both the immediate and the long term, defining areas for implementation and specific projects, such as Healthcare/Telemedicine, Smart Cities, and Connected Schools, as well as to develop an educational strategy based on Cisco Networking Academy. "Digitization is a key driver for economic development in any country. Through this partnership with Digicel, our goal is to grow GDP, create new jobs and invest in a sustainable innovation ecosystem across public and private sectors in the Caribbean and Central America," says Alison Gleeson, Senior Vice President of the Americas, Cisco. "The Cisco and Digicel collaboration will map pathways to growth for countries throughout the region, positioning them for long-term prosperity in the digital age." Frontier Communications reports that it is ahead of schedule in deploying rural broadband, exceeding 2017 milestone requirements of the Connect America Fund program (CAF) in eight additional states. The carrier is now ahead of schedule in Florida, Idaho, Illinois, Indiana, Michigan, Tennessee, Texas, and Wisconsin. This is in addition to Arizona, Connecticut, Georgia, Montana, New York, North Carolina, Pennsylvania, Washington and West Virginia as having reached the 40 percent milestone. Nationally, Frontier now provides broadband to over approximately 331,000 and small businesses in its CAF-eligible areas and has improved speeds to over approximately 875,000 additional homes and businesses. “We are piling up broadband milestones as we make a strong broadband deployment push to close out 2017," said Mark D. Nielsen, Frontier Executive Vice President and Chief Legal Officer. "The combination of CAF and Frontier's investments have enabled new broadband connections that are vital to closing the digital divide. Every day we see our customers benefiting from the significant economic and educational benefits of broadband connectivity." 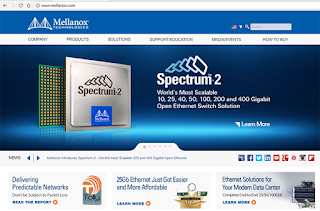 Meituan.com will deploy Mellanox Spectrum Ethernet switches, ConnectX adapters and LinkX cables to accelerate its multi-thousand servers for their artificial intelligence, big data analytics and cloud data centers. The installation will use Mellanox 25 Gigabit and 100 Gigabit smart interconnect solutions and RDMA technology. Meituan.com is the world’s leading online and on-demand delivery platform, supporting 280 million mobile users and 5 million merchants across 2,180 cities in China, and processing up to 21 million orders a day during peak times.